“Class, today we are going to plant seeds. I've given you each a plastic cup with dirt in it. Pick up the seed and push it into the middle with your finger.” Miss Crawford instructed her students. “They're pumpkin seeds. 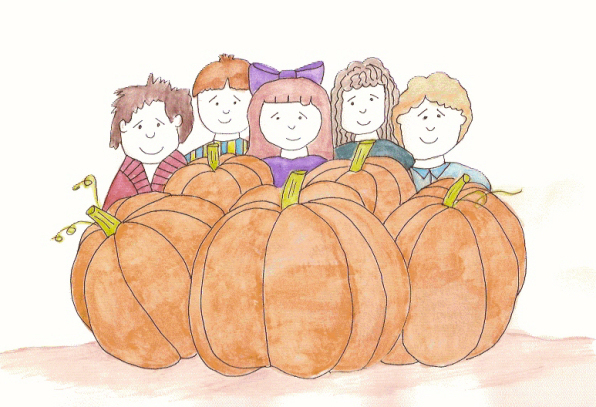 One day this seed will grow into a huge pumpkin.” The teacher smiled, her eyes widening. “We can't grow a pumpkin in this cup, Miss Crawford,” Randy said. “Pumpkins get this big.” He held his arms out to the side. The students poked their seeds in and carried their cups over to the sink. Miss Crawford had instructed them to put water in the cup, just enough to wet the soil, but not too much. After two weeks each pumpkin seed had sprouted, poking their green heads through the dirt. They kept watering them and giving them a lot of sunshine. After another few days Miss Crawford said, “Class, now is the time for you to take home your pumpkins. Plant them in a sunny location, water them every day with your hose or a watering can and by the end of summer you'll have one or two huge pumpkins growing on the vines. The next day the mom's and dad's brought their children's pumpkins to school. Some were much larger than others. Kira's wasn't that big. She could carry it by herself. Donald's, Angela's, Percy's, Jack's and Emily's were the biggest. Their father's had to carry them in. The children were proud too. They took their pumpkins home again that night and carved them into jack-o-lanterns for the holidays.